A few weeks ago, my friend Catherine McCord sent me a copy of her new cookbook, Weelicious. I met Catherine at the BlogHer Conference in Seattle this past summer. I immediately knew she was destined for great things. She is passionate about her blog, and she’s really dedicated herself to creating healthy food options for busy families on the go. Catherine’s site Weelicious is super successful, and I’m sure her new cookbook will be, too. It’s full of quick, healthy, kid-friendly recipes and cooking tips. It’s not a kosher cookbook, but it does have lots of options for those who keep kosher. Busy families will love this book, it’s full of fun and easy ideas to nourish your family. When the weather begins cooling down and the skies are overcast, there’s nothing quite like a slow cooker meal to warm the tummy and comfort the spirit. 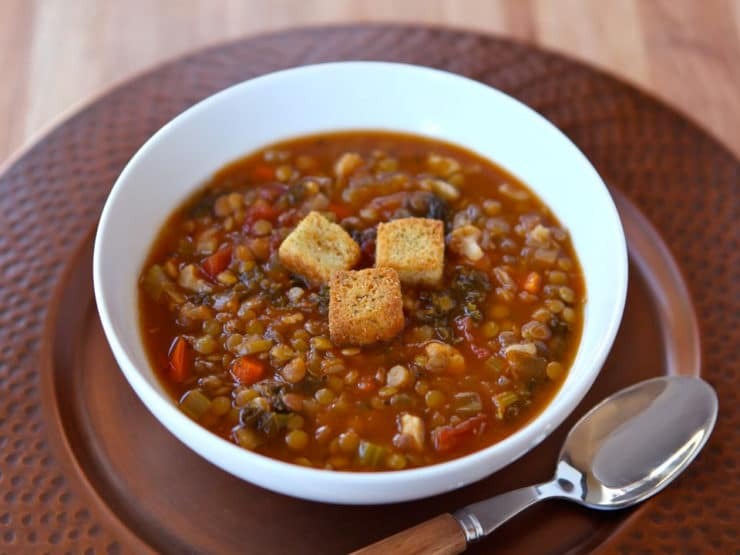 I adapted the following recipe from Catherine’s “Slow-Cooker Lentil Veggie Stew” in the Weelicious cookbook. The original recipe is a great base to work from. I decided to spice it up a bit– which little kid mouths might not appreciate, but in our family everything gets the spicy treatment! I added cumin, black pepper, and cayenne to the mix. I also threw in some cauliflower to add some texture and bulk to the soup, while keeping things low cal. Catherine suggests topping the stew with plain yogurt, herbed goat cheese, feta, crème fraîche, or grated Parmesan. We stirred in some Greek yogurt and lowfat sour cream because it’s what we had on hand. Both were terrific, they added a nice creamy touch to the broth. Obviously you can leave the dairy products out to keep the stew vegan or pareve. I also threw in a few seasoned breadcrumbs, they sopped up the soup and tasted awesome. On its own, the stew is simple, natural comfort food– gluten free, low fat, low calorie, and vegan. Good for the body, good for the soul. What could be better? What was your favorite meal when you were a kid? All entrants will be subscribed to my weekly newsletter (unless you are already subscribed). Two winners will be chosen at random and notified via email. Contest ends at 5:00pm PST on Friday, October 12, 2012. CONTEST ENDED. Congrats to Toni and Mary Ann! 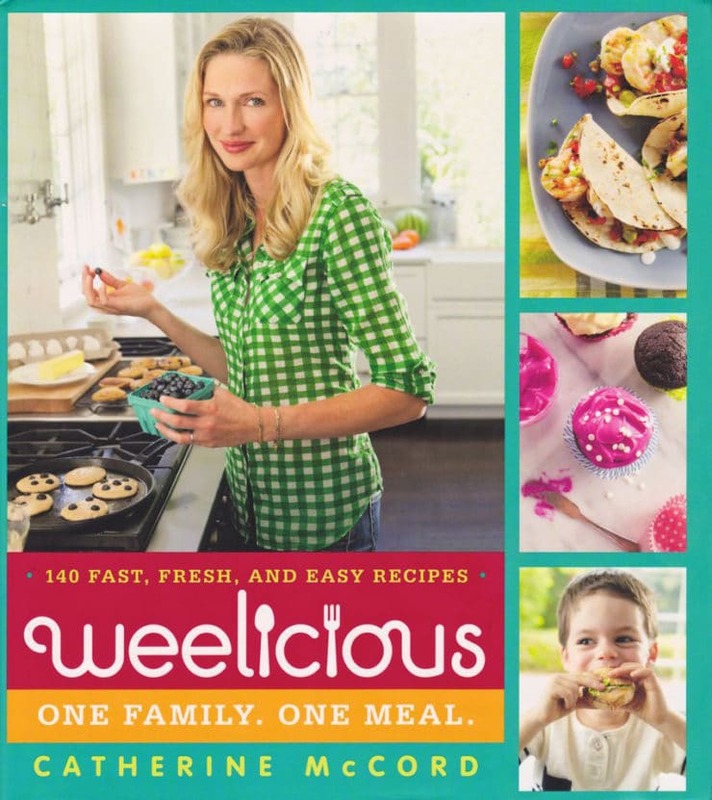 Learn more about the Weelicious cookbook, and buy your own copy – click here. 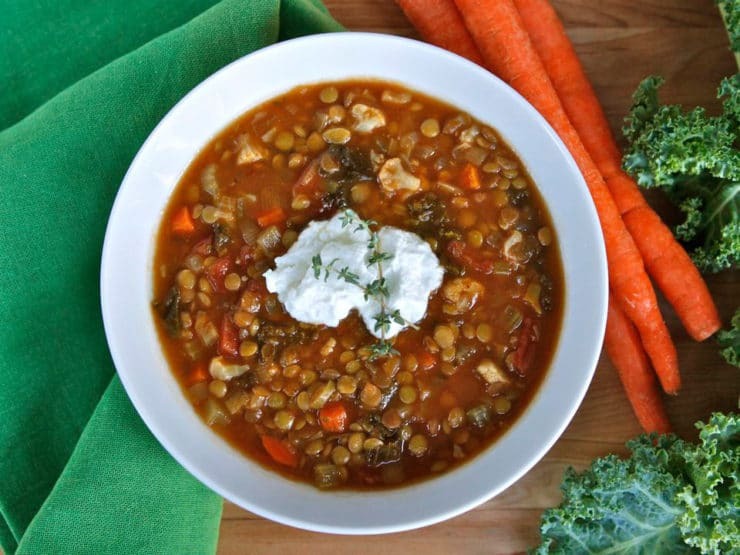 A recipe for Slow Cooker Lentil Cauliflower Stew from The Weelicous Cookbook by Catherine McCord. Vegan, Gluten Free, Pareve. Sort the lentils, discarding any stones or impurities. 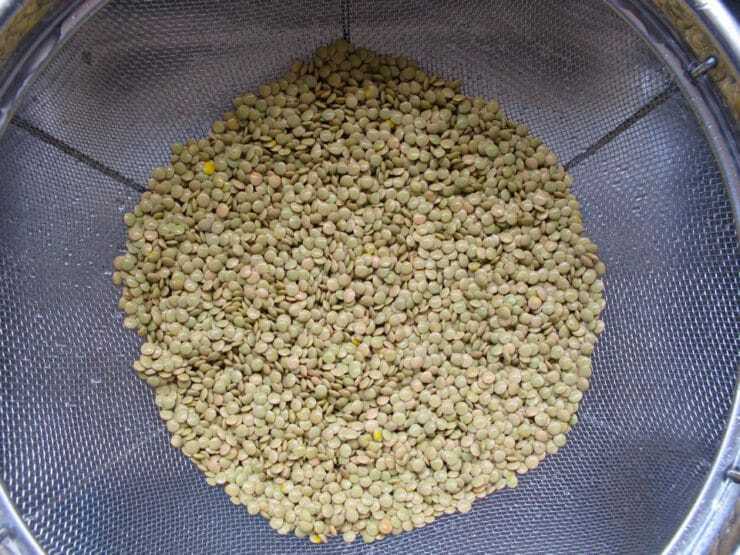 Rinse the lentils in a wire mesh strainer. Heat the oil in a skillet over medium heat. 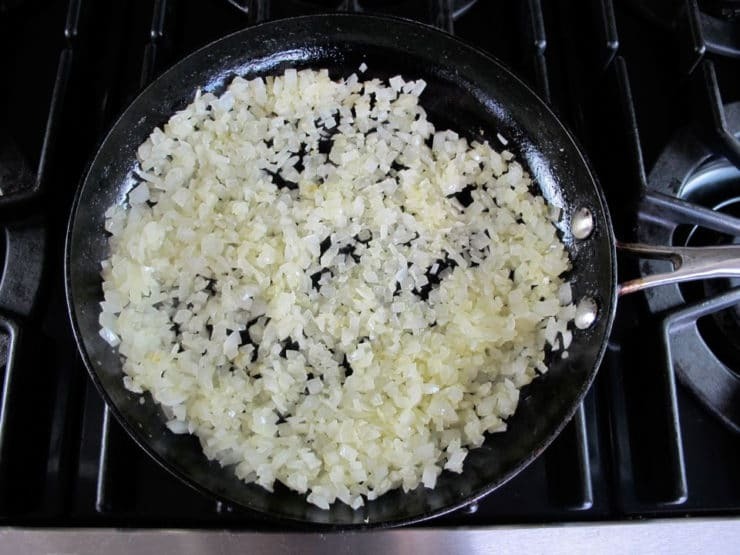 Saute the onion for about 4 minutes, till softened. Add the chopped garlic and saute for another minute. Pour the softened onions and garlic into the slow cooker and add the remaining ingredients (minus toppings). Cover the slow cooker and turn heat to high. Set timer to 6 hours on high, or 8 hours on low, until the lentils are tender. 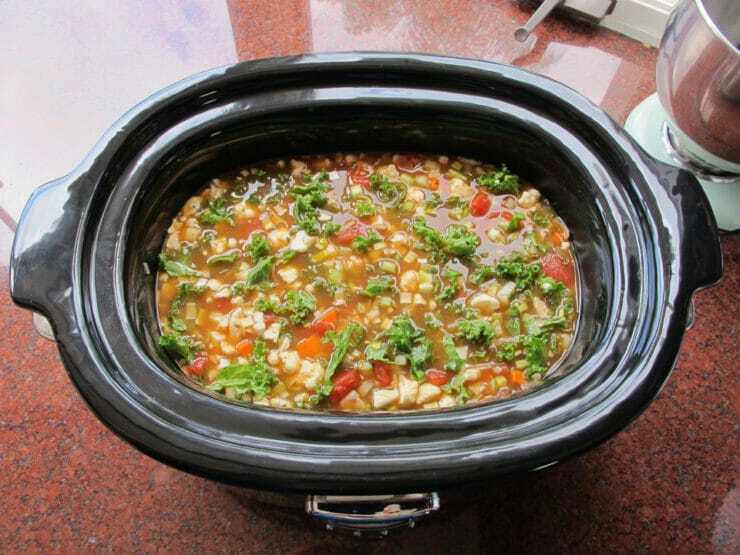 If you'd prefer not to use a slow cooker, you can cook the stew in a large pot over medium-low to low heat, covered, for about 90 minutes until the lentils are tender. I just made this recipe following your instructions verbatim and the lentils are still hard after cooking on high for 8 hours. The broth tastes yummy and I love the cauliflower but am disappointed in the lentils. Wondering what I might have done wrong? 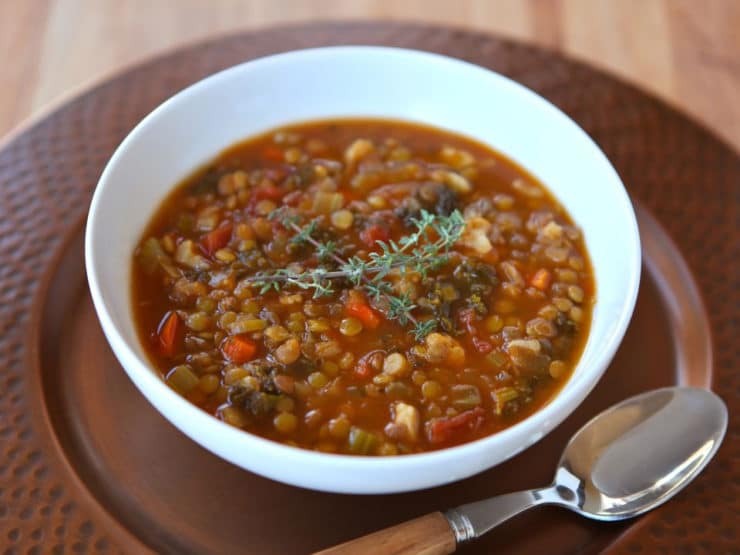 Two potential issues – either the lentils you used are old, which means they may have trouble softening, or your slow cooker runs cooler than the test kitchen one and didn’t heat them enough. If the second issue is to blame, you can put it on the stovetop, adding water as needed, and simmer until they soften. Are we able to use lentils that are pre-rinsed? Refrigerated from Trader Joe’s … ? You mean pre-cooked lentils, I’m guessing. Yes, you can, but they may become slightly mushy if cooked as long as the recipe recommends. Try adding the lentils halfway through cooking so they don’t overcook. It doesn’t look like there is any stock or water added to this recipe. Am I reading that correctly? 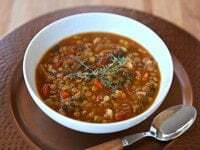 Is the juice from the tomatoes enough for the lentils to cook? Thanks! The recipe also calls for 8 cups of low sodium vegetable stock. Oops! Sorry, I missed that. Thank you for sharing your wonderful recipes. You are my go-to source for holiday menus. I have made many apple cakes over the years and found a winner here. Every time I make it, I’m asked for the recipe. This is an excellent recipe. Easy to make and full of flavor!! Very very good. Simple to make I am very happy. My first time on this site, I will certainly return. I want to be sure the lentils will cook, so could you tell me what power is your slow cooker? My (UK) slow cooker is 105 W on low, 135 W on high. Hi Hengist, I just checked and my slow cooker says 320 W. I’m not sure how many watts are used on low vs. high, though. I have had this trouble with recipes. Usually recipes remedy this by address by tomatoes in the last 30-90 minutes of cooking. There are also two different schools of thought on whether salt helps or hurts the softening of some legumes. I sometimes soak legumes after rinsing until they are ready to be cooked. If I soak, I add less water/liquid than the recipe calls for. The longer they soak (absorb water,) the less liquid is needed in the recipe. Why is the prep time listed as 15 hours 45 minutes?? To me this should say about 15 minutes. Hi Cara– sorry about that. My recipe software went through an update recently and what used to be four fields were reduced to two, making hours look like minutes. I’ve corrected the issue on this post. Have to go check others now!